San Francisco (Obama.net)- It was nearly twenty months ago that Rod Blagojevich, the former Governor of the state of Illinois, was stripped of his position for allegedly trying to sell the seat held by Barack Obama in the United States Senate prior to his becoming President. Tuesday, after exactly two full weeks of deliberation, the former respected official was told of his fate. 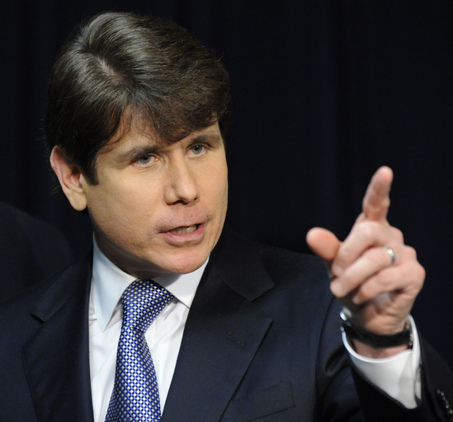 The jury had agreed that Blagojevich was in fact guilty of providing the FBI with incorrect information knowingly. However, among the other 23 charges against the former governor of Illinois, the jury was hung on all of them. Among the counts that the jury was hung on included wire fraud, racketeering’s, as well as bribery and attempted extortion. The charges against Blagojevich of racketeering, extortion attempts, and wire fraud could lead to a score in prison and a potential fine of a quarter of a million dollars. The bribery charge could lead to a decade behind bars and another quarter of a million dollar fine. The charge of providing false information to the FBI can send Blagojevich to prison for five years and cost him $250,000. Robert Blagojevich made it clear that he believes his brother was not being corrupt or trying to personally profit financially from the attempted sale of President Obama’s old Senate seat, but was instead doing it for political purposes. The former Governor has repeatedly told the media that he is completely innocent of the accusations made against him. Prior to the trial reaching court, Blagojevich went on a tour of the media outlets to do interviews and defend himself against the onslaught of media scrutiny. Much to his chagrin, the jury assigned to the case did not see it as the cast member of “Celebrity Apprentice” did. August 26th has been set as the upcoming date in court for this case. While thus far only being found guilty on one charge, the potential penalty of the one charge alone is reason enough for Blagojevich to be upset as he may now be a matter of days away from seeing the inside of a prison cell on a daily basis.